Eric started fishing not long after he learned to walk, and since then his love for the outdoors and Wyoming’s rivers have come to dominate most of his time. During the fall, winter and spring Eric is a teacher at Pinedale High School and coaches basketball and track. Before moving to Pinedale, Eric lived in Cody, Wyoming where he learned to fly fish on the North Fork, South Fork and Clarks Fork rivers. After high school Eric started tying flies and working as a guide for Big Bear Lodge, where he guided trips into Yellowstone National Park. After Eric finished playing basketball for the University of Great Falls Montana, he completed his Masters degree at Idaho State University where he meet his beautiful wife, Liz. While in Idaho, Eric began building fly rods to pass the time during the cold winter months, however, as soon as an opportunity came to move back to Western Wyoming, they did. 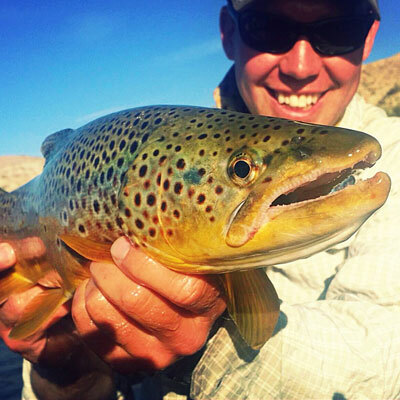 Eric and his family live in Pinedale year-round and over the years he has learned the local waters. Eric’s diversity of fishing skills include casting to sipping trout with size 18 BWO to casting big streamers to meat-eating browns when the hatches are over. Eric’s love for fly fishing and tying new patterns has taken him all over the Rocky Mountain states searching for wild trout. Eric’s passion is teaching new anglers the skills of the sport and floating our local rivers in search of that fish-of-a-lifetime.